What: The Mountain West title is at stake as the Broncos host the Bulldogs. When: Saturday, December 2 at 4:45 p.m.
2017 Records: Bulldogs 9-3 (7-1 Mountain West). Broncos 9-3 (7-1 Mountain West). 2016 Records: Bulldogs 1-11 (1-8 Mountain West). Broncos 10-3 (6-2 Mountain West). Previous: Broncos lost to Fresno St. 28-17. Bulldogs def. Boise St. 28-17. Head Coaches (overall records): Bulldogs - Jeff Tedford (91-60). Broncos - Bryan Harsin (38-12). Fresno St. Notes: In his first year with the Bulldogs, former Oregon St. quarterback Marcus McMaryion has completed 169 of 269 passes for 2,212 yards with 14 touchdowns and 3 interceptions. He also has rushed 41 times for 219 yards. The 219 may not seem like much, but McMaryion is always a threat to run. He's played smart football this season and limits turnovers. He completed 23 of 36 passes for 332 touchdowns in the Bulldogs' win over Boise St. on Nov. 25. Three players have reached the 400 rushing yard plateau, with Jordan Mims leading the way with his 137 carries for 595 yards and 6 touchdowns. Josh Hokit has 473 yards on 108 carries and 7 touchdowns, and Ronnie Rivers has rushed 91 times for 456 yards and 5 scores. KeeShean Johnson is the top receiver with 64 grabs for 860 yards sand 8 touchdowns, including 6 receptions for 119 yards and 2 touchdowns in the Bulldogs' win over Boise St. on Nov. 25. Da'Mari Scott has 51 catches for 54 yards and a touchdown. The Bulldogs are 12th in the FBS in points allowed at 17.3 per game. They've won eight of their last nine games. Fresno St. is bowl bound and, like Boise St., could find themselves in a more prestigious bowl game should they win this one. Boise St. Notes: Quarterback Brett Rypien, nephew of Super Bowl winning quarterback Mark Rypien, was the primary signal caller and completed 181 of 280 passes for 2,269 yards with 14 touchdowns and 4 interceptions. Rypien went 22 of 31 for 278 yards in the Broncos' loss to Fresno St. on Nov. 25. He has been spelled at times by Kansas transfer Montell Cozart, who is the more mobile of the two. For the season, Cozart has gone 58 of 91 for 738 yards with 10 touchdowns and an interception. He has also rushed 85 times for 359 yards and 4 scores. Running back Alexander Mattison surpassed the thousand-yard mark last week and now has 1,024 yards on 195 carries with 11 touchdowns. Wide receiver Cedrick Wilson has 65 receptions for 1,142 yards and 6 touchdowns. Tight end Jake Roh, who did not play in the Nov. 25 loss to Fresno St., leads the team with 9 touchdown catches. The Broncos are 33rd in the FBS scoring at 33.3 points per game and 41st with 23.2 points allowed per game. Head coach Bryan Harsin, a former Boise St. quarterback, has led the Broncos to bowl games in his first four years at the helm of the Broncos, going 2-1 thus far. The Broncos wait to hear which bowl they will be headed to to cap this season. 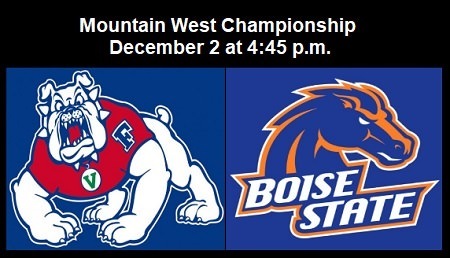 Fact: Despite possessing identical conference and overall records, and Fresno St. having the tiebreaker due to their win over the Broncos on Nov. 25, this game is being played in Boise. This is due to national rankings, which have the Broncos listed higher than the Bulldogs. Twitter: Fresno St. - Boise St. I'm looking forward to a very close game tonight. I give the edge to the Broncos since they're at home. We're just a couple of minutes away from kickoff. Get ready! Fresno St. is making it look easy on their first offensive drive. Good luck to the Broncos! FG try no good. 0-0 with 11:49 left in the 1st. Broncos TE Jake Roh is active. He leads the team in TD receptions with 9. I don't think the defender had control before the ball hit the ground. They should overturn the interception. The Broncos are trying to play the field position game, but it looks like the punt return will be called back due to a illegal block penalty. Seems like I've seen more of those this season than in previous seasons, at all levels. FG Boise St. Haden Hoggarth 31 yards. Three is better than zero, but not as good as seven.